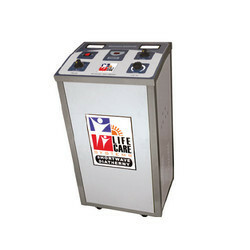 We are manufacturers & suppliers of Shortwave Diathermy Unit & Shortwave Diathermy machine from Ghaziabad, India. Our Shortwave Diathermy Units are widely used in clinics & hospitals.Short Wave Diathermy current is a high frequency alternating current. The heat energy obtained from the wave is used for giving relief to the patient. Its frequency is … cycles per second and the wave length is … Short wave diathermy applications. Shortwave Diathermy Unit uses the diathermy process that includes electrically induced heat for treating diseases. This is known to provide a unique induction field circuitry. Thus, it offers a short wave frequency of 27.12 MHz that is required to penetrate deeply into muscle tissue without affecting bone and fatty layer.